On Wednesday afternoon, the Oakland Raiders confirmed that history will be made in their playoff game against the Houston Texans Saturday: Rookie quarterback Connor Cook will become the first signal-caller in the Super Bowl era to make his NFL debut in a playoff game. It’s probably not the way Cook wanted to enter the record books. 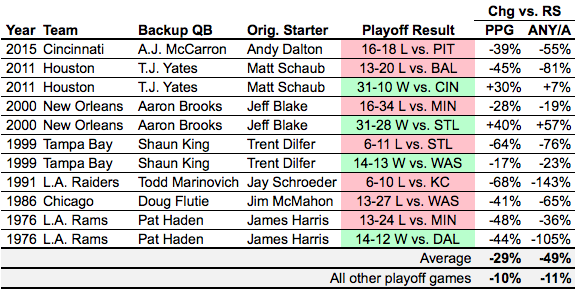 Things rarely go well when a team is forced to use a backup QB, particularly in the playoffs. Since 1966, there have been 86 playoff games where a team’s primary passer1 wasn’t the same as the team’s usual QB from the regular season;2 in those games, the team in question scored 21 percent fewer points than their seasonal per-game average, and their passing efficiency (as measured by adjusted net yards per attempt) was 20 percent worse than normal. It’s only an 11-game sample, but offenses led by rookie backups tend to collapse even harder than those directed by stand-ins with some NFL experience. Those teams’ points per game declined by 29 percent and their passing efficiency by 49 percent when compared with their regular-season averages. The good news for Oakland, however, is that the Texans are also dealing with a quarterback crisis of their own. And although the backup QBs in my dataset above tended to play horribly, they still managed to scratch out a victory more than 35 percent of the time — as did rookie backups. So although Cook may be historically inexperienced for a playoff starter, it wouldn’t exactly be inconceivable for the Raiders to pull off the win anyway. i.e., the quarterback who led the team in dropbacks during the game. i.e., the quarterback who led the team in dropbacks during the season.